We must stress that all parts of the plant contain an enzyme that is extremely poisonous for little children or pets. If any part of the plant is consumed, this enzyme causes swelling of the pharynx and the tongue to a point where it can obstruct airways and lead to death. Place these plants at spots where kids and pets cannot reach, e.g. on top of a table or shelf or even better on a window-sill. If there is no way to keep the plant away from your "hungry" roommates, avoid getting a dieffenbachia or if you already have one think about handing it over to a friend. Light: The Dieffenbachia prefers a moderate dose of filtered light. It will not do well with full exposure to direct sunlight. 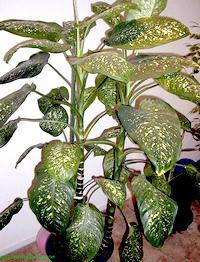 Water Habits: The Dieffenbachia will grow best when watered thoroughly and then allowed to dry between waterings. Water the soil until it becomes very dark, but not to the point that the water is no longer being soaked by the soil. Potting the plant to allow for proper drainage will help guard against over watering. Dieffenbachia is among the most popular ornamental plants sold in the United States for the fact that they are one of the most durable indoor plants available. The plant can strive off filtered sunlight which makes it a plant that can survive and still look good with some abuse. The Dieffenbachia is also good for filling the container by sending out suckers.